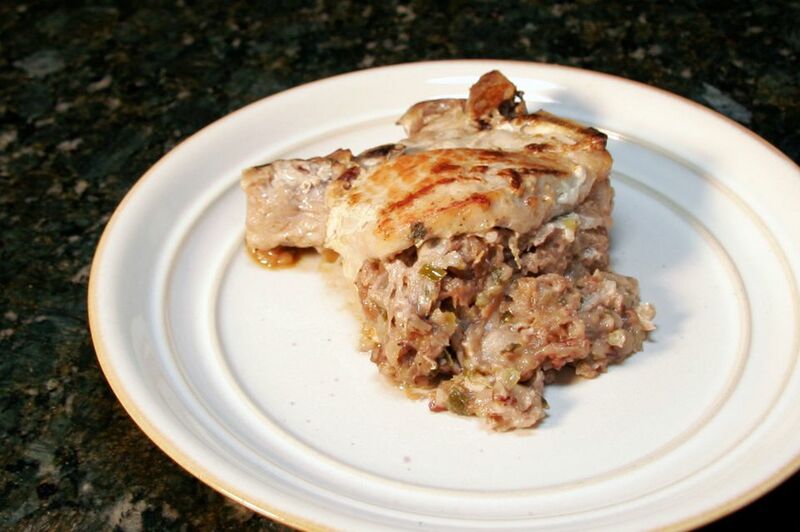 Big thick pork chops are stuffed with an apple mixture for a delicious meal for four. For a dinner for two, feel free to halve the recipe. Rinse chops and trim excess fat. Cut a pocket into the meaty side of each chop, cutting to the bone. In a skillet, heat butter over medium-low heat. Add chopped apple and celery; cook until tender, adding chicken broth, a little at a time, to keep the mixture moist. Stir in raisins, if using, and pecans, maple syrup, and green onions. Cook the mixture, stirring constantly, for about 1 minute longer. Add torn bread and stir until well moistened, adding more chicken broth as needed. Season to taste with a little salt and pepper. In a large oven-safe skillet over medium-high heat, heat the vegetable oil. Brown chops, carefully turning to brown both sides. If there is any leftover stuffing, spoon into the center of the skillet. Cover the pan with lid or foil and transfer to the oven. Bake for 45 minutes, until pork chops are cooked through.